I found this advertisement for Fenestra Casements in the July 1927 issue of The Architectural Record. The image is of Carlton Terrace, now the Carlton Terrace Apartments at 4626 N. Magnolia. 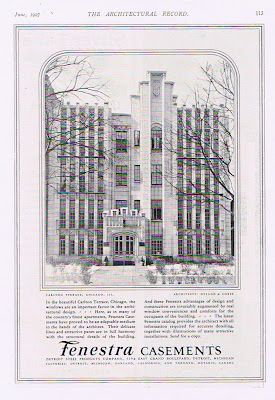 The text reads: "In the beautiful Carlton Terrace, Chicago, the windows are an important factor in the architectural design. Here, as in many of the country's finest apartments, Fenestra Casements have proved to be an adaptable medium in the hands of the architect. Their delicate lines and attractive panes are in full harmony with the structural details of the building. And these Fenestra advantages of design and construction are invariably augmented by real window convenience and comforts for the occupants of the building. The latest Fenestra catalog provides the architect with all information required for accurate detailing, together with illustrations of many attractive installations. Send for a copy." That really is an amazing building. Thanks for the great pictures of Uptown. Knowing more about the history of our neighborhood makes us more proud to live here. Thanks for your comments, UU. It's fun to think about the people who lived here before, what they did, where they shopped, and what the streets looked like. Uptown will be around long after we're gone; it's important that each of us, in our own way, continues to ensure it's a great neighborhood to pass on.